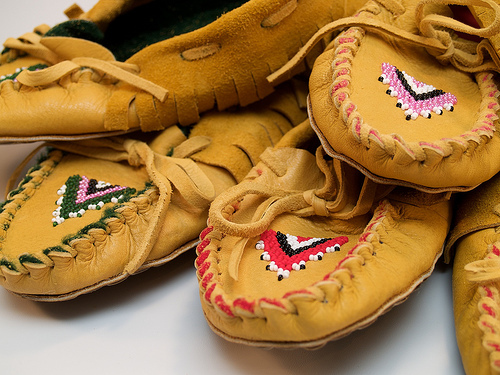 Note: Welcome to my blog if you’ve come for the first time through a search for “moccasins.” I ask that you please read this post in full before contacting me for more information. Enjoy! Several years ago when my friend Tahnie got married, as part of her bridal party I received a pair of custom-made moccasins to wear with my dress. Tahnie is from Six Nations of the Grand River, and this was one way she acknowledged her cultural heritage at her wedding. The wedding was held at the Ancaster Old Mill where there were several other weddings going on that evening, and let me tell you, all the other bridesmaids for the other weddings were super jealous of our comfy footwear. So ever since, I’ve wanted to do this for my loved ones. 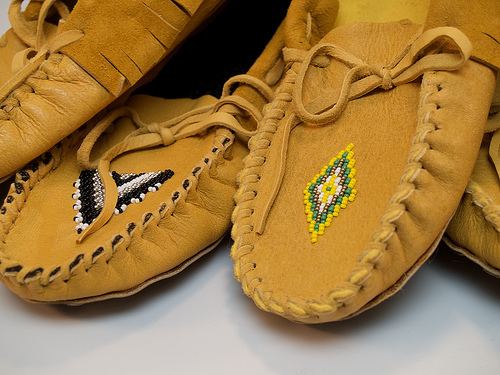 Moccasins have to be the most perfect form of footwear, because they form perfectly to your feet, like a pair of gloves. Back in the spring I traced everyone’s feet and noted their favourite colours. I think they all suspected I was knitting something, which I happily let them believe. Through Tahnie, I placed the order and ta-da! My Christmas shopping was 90% complete! Chris got his a bit early because he was in on the secret. On Christmas day everyone got their new moccasins and I think they are a huge success. And I should add that the artist who created these beauties doesn’t do it for just anyone, so I feel extra special that she created them for me, and for my loved ones. They are a treat that I know everyone will cherish for years to come. Can you send me infor to get these shoes aswell? THankyou!! where can i get these moccasins? Folks, if you read the blog post, you will see that I mentioned, “the artist doesn’t do these for just anyone.” She is mostly retired and only does them for friends and family, so I’m afraid I can’t tell you were to get them. Thanks for dropping by. Just wondering where i could get some high top moccasins and how much they would be? Wanting them for christmas. These are absolutely beautiful! Would you please send me the information as well so I can order from her! Thanks sooooo much.